This Axis mainly concerns nano-structured materials and their transport properties involving a large range of different scales, combining experimental, numerical and theoretical analyses. These materials are characterized by large surface/volume ratios and their physical and mechanical properties are linked to the surface effects. The understanding of these effects and they impacts on the material properties (adsorption, transport, optical, mechanical, …) requires the study of interface phenomenon at the atomic scale. This Axis includes both experimental and theoretical aspects. 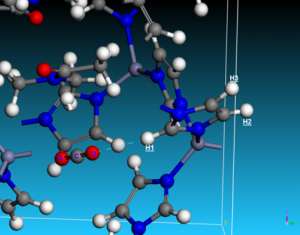 Modeling: atomistic calculations, molecular dynamics simulations and continuum treatments via multi-scale methodologies. Synthesis: innovative techniques (soft chemistry,…) controlling the microstructure (porosity,…) and their functionalizations. Analysis: imaging, IR and RMN spectroscopies, XRD. 1. Preparation, characterization and modeling of clay-polymer nanocomposites (CPNs). Challenges are developing CPNs with advanced properties with control at the molecular level of the interface properties of clay nanoplatelets-filled polymer resins. Van Son Vo PhD project. New green approaches have been developed to functionalize native clays, solvent-free protocols were applied to prepare polymer nanocomposites, while biopolymers (cellulose, chitosan) or bio-based precursors (epoxidized vegetal oils) served as dispersion media such that the new reactive and pre-exfoliated clay nanofillers may be further incorporated in a diverse set of biopolymer matrices in order to improve mechanical behavior. Hanene Salmi post-doctoral project. The preparation of CPNs by living free radical photopolymerization initiated from a lamellar clay-anchored photoiniferter resulting from a cation exchange reaction of sodium by diethyldithiocarbamate benzyldiazonium tetra-fluoroborate salt has been explored. The cation exchange method produces intercalated nanocomposite materials with an important organic mass loading around 41wt%. More importantly, the content of organic component included in the final nanocomposite material could be controlled by the diazonium salt concentration used during the synthesis. The final nanocomposites are soluble in chloroform and have potential as specialty, reactive fillers for epoxy resins employed in civil engineering. RMN spectroscopy techniques have been used in order to follow the evolution of clay microstructure as a function water content Agnieska Nowacka post-doctoral project. TEM images showing the increase in the d-interlayer spacing from 1.1 nm for native clay (a) to 3 nm for clay nanofiller obtained after 2h of photopolymerization (b). Correlation between the change in d-interlayer spacing (Dd) and the amount of polymer (Dn) incorporated within the clay layers (c). Some models and numerical frame works have been performed for investigating the multiscale mechanical behavior of elaborated CPNs at both molecular scale and microscale. The results show that the macroscopic rigidity of CPNs material depends not only on the clay’s volume fraction but also on the morphological arrangements of nanoclays in the matrix. Molecular models of PCNs systems with (a) 100, (b) 60 and (c) 20 of representative cross linked resin epoxy molecules. These models represent the change from exfoliated to intercalated structure of CPNs. Computation of m acroscopic elastic properties : (a)Exfoliated structure; (b)Intercalated structure; (c) Youg modulus for exfoliated and intercalated structures. 2. 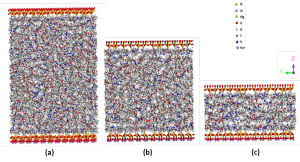 Porous materials and their fluid transport properties. 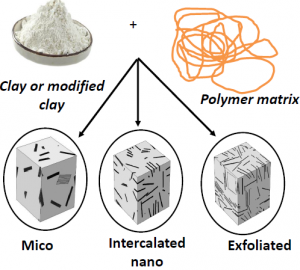 Biporous polymeric materials with controlled pore size and connectivity: conception, characterization, and modelling Hay Ban Ly and Sarra Mezhoud PhD projects. The development of versatile and effective approaches to biocompatible doubly porous poly(2-hydroxyethyl methacrylate) (PHEMA)-based materials has been addressed. Advantage of doubly porous materials was taken through different functionalization reactions using carbonyldiimidazole chemistry, and further immobilization of in-situ generated gold nanoparticles. Such hybrid doubly porous materials have been proved to act as efficient catalytic supports in the reduction of nitro-arenes. 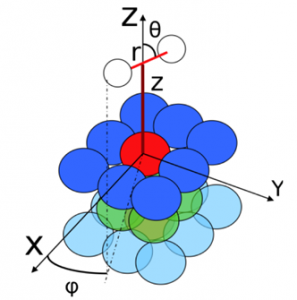 The permeability of doubly porous materials has been numerically determined using periodic homogenization theories and on unit cell calculations. The first upscaling consisted in the determination of a first permeability associated with the array of nanoscopic pores. Various 2-D and 3-D examples have illustrated the accuracy and the capacity of the proposed numerical methods to compute the macroscopic permeability of biporous materials. Understanding the mechanisms of liquid transfer in wood Meng Zhou pHD project. 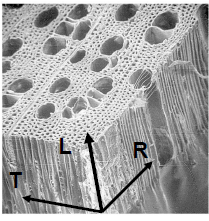 Study of transport properties in porous media, the understanding of the mechanisms of liquid transfer in wood. A series of tests of imbibition with poplar samples of different sizes has allowed to understand that the longitudinal transfers can be divided in elementary transfers through the channel between two successive concentric tree rings. The original point is the study of these systems with MRI (Magnetic Resonance Imaging). It has been shown that the water penetrates in capillaries of different sizes with different timings, so that the penetration is very heterogeneous. 3. Studies of metallic compounds. Multiscale modeling of metal-hydrogen systems: The reversible absorption of hydrogen by some metals that can lead to the stabilization of new solid phases called hydrides with, also in this case, applications in hydrogen storage for energetic use, prevention of structural light alloys weakening,… Natacha Bourgeois PhD project. Thermodynamics and mechanical behaviour of high entropy multi-element alloys: the aim is to define t he zone of stability of the solid solution in the Co‐Cr-Fe-Mn-Ni system, i.e. multi-element alloys composed of five or more principal elements with concentrations between 5 and 35 at. %. The Calphad approach combined with the new HEA Thermo-Calc database have been used to predict the thermodynamically stable phases for various composition and temperature. The reliability of the results provided by Thermo-Calc has been checked by the elaboration and characterization (XRD, SEM). Guillaume Bracq PhD project. Electronic structure calculations (DFT or configuration interaction methods) to accurately determine lo ng ranges interactions. The challenge is to reproduce the physisorption phenomena. Different types of adsorption of carbon clusters and organic molecules on Cu(111) surface have been explored as a first step study of the interaction of the edges of defects of graphen. Masoud Shahrokhi post-doctoral project. Investigation of the carbon dioxide sequestration at the microscopic level: Universality of the type of the interactions governing the interaction of carbon dioxyde with imidazole either isolated, attached to gold cluster, gold surface or withi n the zeolitic imidazolate framework (ZIFs). Muthuramalingam Prakash post-doctoral project. Physisorption and chimisorption of dihydrogen on Cu or Ag surface. Both the energetics and dynamics have been considered. Methodology based on embedded clusters has been used. A better understanding of the adsorption of molecule is of major interest for heterogeneous catalysis. Another possible application could be hydrogen storage. Eddy Bernard PhD project. 5. Development of new low cost and eco-friendly coatings. Design of flexible and ductile coatings with long‐time antibacterial properties against pathogenic bacteria (essentially with Escherichia coli and Staphylococcus aureus) is of prime importance in the general domain of hospital safety and pathogenic infection in hospitals. The proposed photochemical methodology for developing hybrid coatings will offer extended life expectancy over the different antibacterial coatings described in literature. Generation of protective coating based on the use of graphene to improve corrosion protection. An efficient method of coating several metallic substrates such as aluminum, titanium, steel, and their alloys will be developed. The graphene will grow directly on the surface after chemical vapor deposition without catalyst. This experimental work will be completed by systematic theoretical investigations mainly based on DFT, going further the results obtained for graphene on Cu.